Apartment for sale in Isola Rossa, walking distance from the magnificent beach of La Marinedda. Northern Sardinia, apartment for sale in Isola Rossa, a unique opportunity just 500 meters from the marvelous La Marinedda beach. The accommodation, located on the ground floor, is part of “La Misuaglia”, a residence of 50 flats, built in the late 90s. This one, is one of the very few objects for sale today near the charming beach of “La Marinedda”. The apartment consists of a bright living room-kitchenette, double bedroom, twin bedroom with ensuite, bathroom, spacious covered veranda with a pleasant sea view and a comfortable veranda at the back of the house. Common parking spaces in the immediate vicinity. This beautiful flat, built in the late 90s is currently funcional and keept, even if some refresh is recomended. This property is for sale fully furnished as shown in photos. 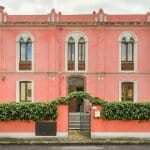 Click here to watch a video dedicated to Isola Rossa and the magnificent beaches within walking distance from this wonderful and rare apartment for sale in Isola Rossa. If you want to see a video dedicated to the house and its location, please click here. For more information about this apartment for sale in Isola Rossa, northern Sardinia, please don’t hesitate to contact us. For all our real estate proposals for sale today in the municipality of Trinità d ’Agultu click here.